On June 5, the 1st game of 77th Kisei-sen between Kisei Yasumitsu Sato and Daisuke Suzuki 8dan was held in Osaka-fu in Japan. 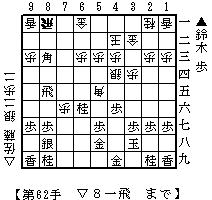 As a result of Furigoma, Suzuki played Sente(Black, lower side of the diagram). The thinking time was 4 hours for both players. Sato won the game with 62 moves. The score after the game was 1-0 led by Sato. Kisei-sen is a 3 win match. You can replay the full game here(Java-enabling browser needed). The diagram in the left is at Suzuki's resignation after Sato made the 62 move of R*8a. It is not easy to understand why Gote(White, upper side of the diagram) won the game since it does not seem both Kings are not be able to be mated immediately. I'm trying to assume why Suzuki resigned this early as follows. After the diagram, the following variations would be expected and all of them would be hopeless for Sente. The second game will be held on June 20. I hope next one will be a close game.